After the many tantalizing reveals in previous E3 shows, it’s understandable to approach the much-hyped Marvel’s Spider-Man with a bit of wariness. 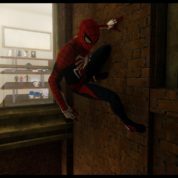 I had played several Spider-Man games in the past which have not quite made the mark. But yes, I am happy to say this is the best Spider-Man game I have played so far. It was almost as if Spidey has webbed my hands to the Dualshock controller – this game is just so hard to put down. 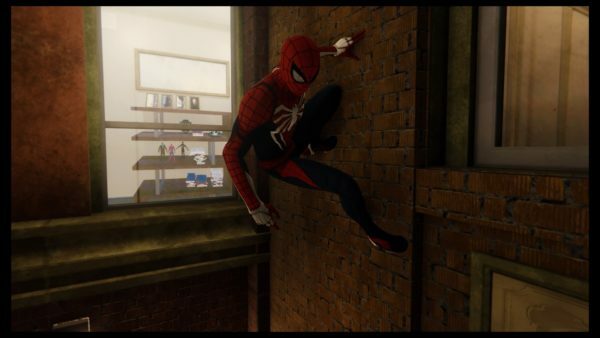 Marvel’s Spider-Man is an action-based open world game set in New York city where you play Spider-Man and his alter-ego, Peter Parker. 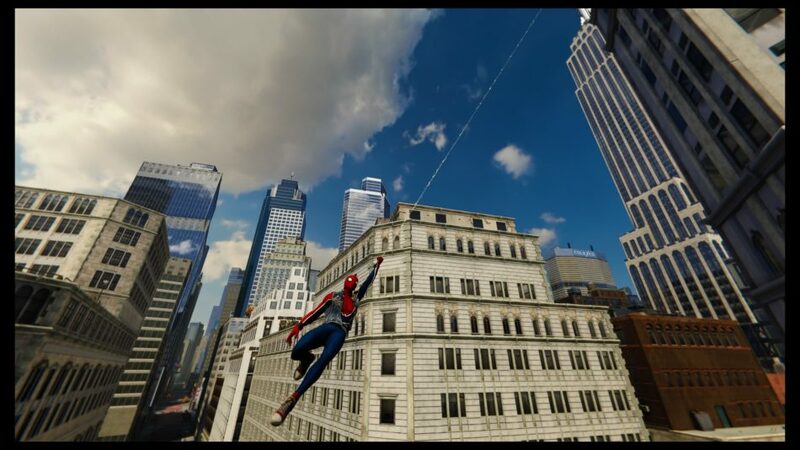 The game is set eight years after Peter Parker became Spider-Man. 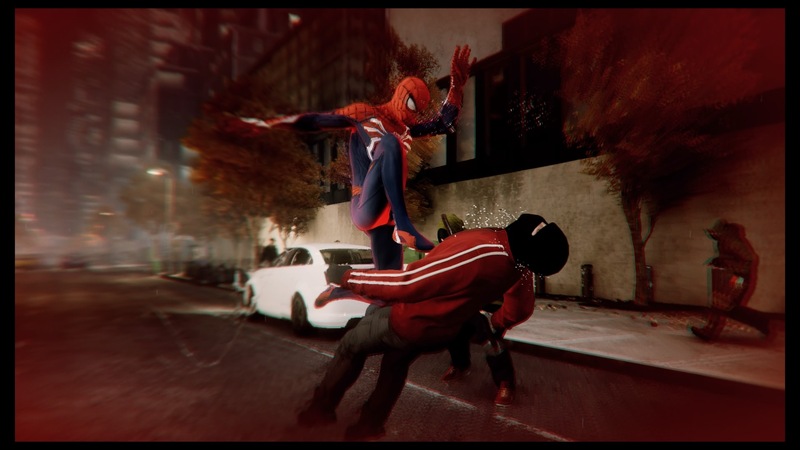 At this point, Spider-Man had successfully tackled several super villains, and is comfortable with his abilities and role as a masked vigilante. However, Peter Parker is struggling to make ends meet working as a research assistant. He had also broken up with Mary Jane. The first mission dives right into the action with Spider-Man going after Wilson “The Kingpin” Fisk while beating back his henchmen. It was a rough start to have a boss battle in the first mission but provides for a good tutorial to learn all the controls. While it takes some time to get used to everything and to execute combos, once you get the hang of it, it is really fun to employ the many methods to inflict pain on the bad guys, either by stealth or melee combat. 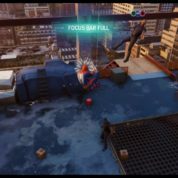 Even swinging through the city with finesse and speed requires quite a bit of practice. 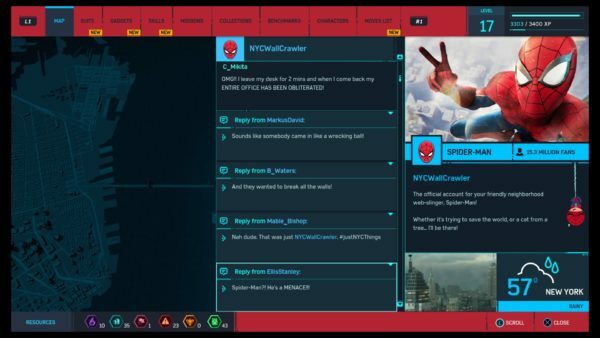 You must master this, however, as some key missions require fast and furious chases across the city, and Spider-Man doesn’t drive. 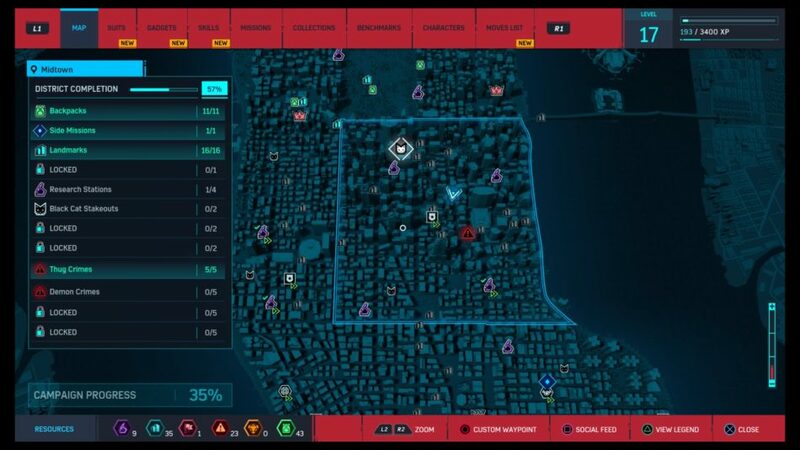 Once Spider-Man repairs the radio towers scattered throughout the city, and probably the very first thing he should be doing, the many side quests, crimes and collectibles will become visible on the map. 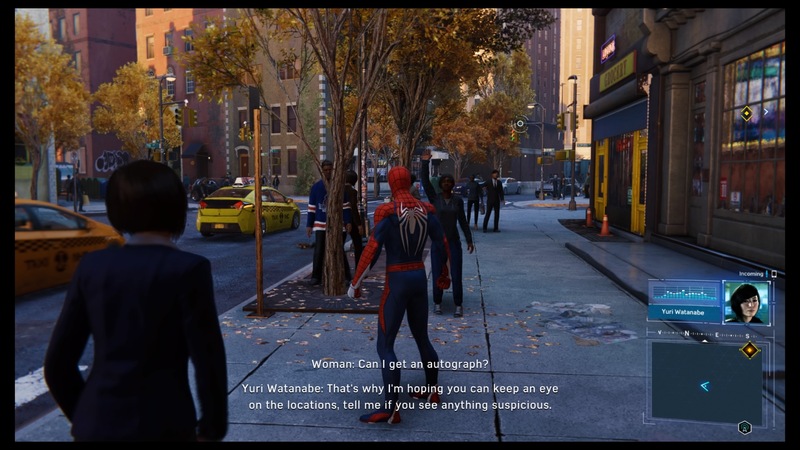 As Spider-Man webslings his way around the city and listens in on the police radio, he can choose to help citizens who are victims of random crime, or thwart the nefarious plans of the bad guys along the way. Adding to the mix of enemies to beat are petty thugs, Fisk’s gangsters, random ambushes, more super villains and crooks, as well as a new terrorist group known as the Demons, who are bent on attacking the city. Completing the main missions will unveil more tasks, which ensures you have to keep returning to the various districts for different purposes. Tired of swinging through the city to get from place to place to complete the many tasks? Spider-Man can also fast travel by taking the subway, although it seems kind of risky to me. To add to the variety, the game even lets you play through some scenarios as other characters, such as Mary Jane, the object of Peter’s romantic interest, while she is working as an investigative journalist. Apart from adding some variety to the gameplay, it is interesting to see and hear her perspective as a woman and a civilian. 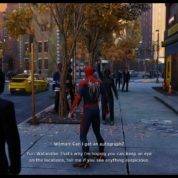 The game is as much about Spider-Man as it is of New York. 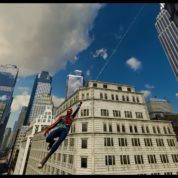 The bustling and vibrant city is rendered in such loving detail that you can truly appreciate the shiny skyscrapers of Wall Street, the glitzy billboards in Times Square, the open greenery of Central Park and the gritty streets of Hell’s Kitchen. With varied day and night scenes, as well as cheerful sunny days and moody rainy weather, the city’s many facets make it a pleasure to view up close and from way up high. Although not a true re-creation of New York, the city has so much energy that it feels truly alive. 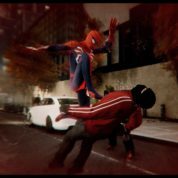 You see people and vehicles going about their business, crimes being committed in the alleys, bystanders applauding Spider-Man when he beat the thugs, approaching him with tip offs, and even asking him for autographs! If you have voyeuristic tendencies, you will appreciate the details through the windows when Spider-Man climbs up buildings. You find furnishings in the living rooms, action figures on shelves and stationery in office cubicles. Adding to the pleasure of instant gratification are the amusing social media feeds that react to Spider-Man’s antics in the city and reported sightings by citizens. 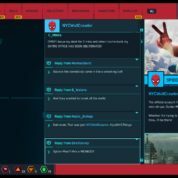 Balancing the love from the fans are brickbats hurled by J. Jonah Jameson by way of radio broadcasts slamming Spider-Man’s actions and putting him down, which make for many entertaining moments. Spider-Man gathers a lot of elements from the best open world action games. You will be activating radio towers on tall buildings to open up new areas of the map to show side quests, collectibles and landmarks, kind of like Assassin’s Creed’s eagle viewpoints. 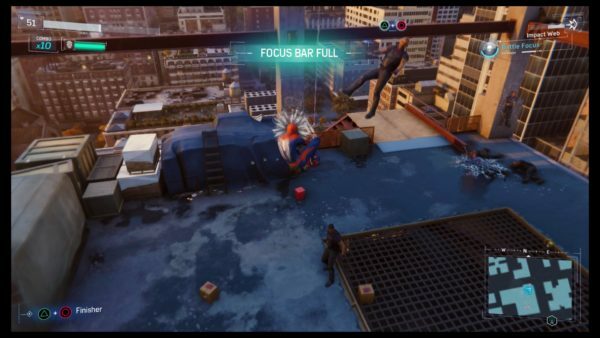 Spider-Man can also use drones and Spidey vision to solve puzzles, just like in Watch Dogs. There are also random and seemingly real-time incidents that require intervention like in Grand Theft Auto V.
And what’s an open world game without collectibles? Marvel’s Spider-Man seeks to please completist gamers by offering plenty of stuff to find, photograph and collect. You can go photographing New York city’s iconic buildings, for starters. Or collect Peter Parker’s old backpacks scattered all over the city with memorabilia that are a real treat for Spidey fans. Think of the menu from the restaurant where he had his first date with MJ or even an adorable Spidey plushie. As part of his day job, Peter works in a lab where he can also solve “Pipe Dream” and spectrogram-type puzzles. This will earn Research tokens required for unlocking new suits. More research tokens can also be obtained by performing environmentally responsible research tasks for rooftop labs scattered throughout the city. With collectibles to find, landmarks to photograph and research mini games, there is so much to do outside of the main quest. Yet, the game cleverly forces you to progress in the main mission before unlocking additional tasks. These provide for more than just the satisfaction of completion or collection. 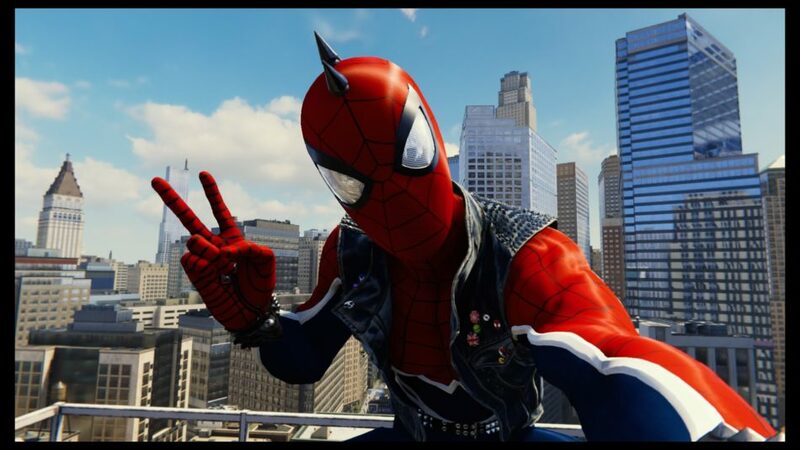 Tokens can unlock new suits, gadgets and powers for Spider-Man, such as the crazy Spider-Man Rock Out suit that endows him with an outrageous special move – using an electric guitar to blast enemies away with a radius of noise. The combat system is nothing short of amazing. There are plenty of skills, moves, special powers and gadgets that Spider-Man can use in a fight. 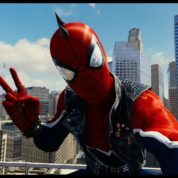 Apart from punching and kicking, he can use webs to swing enemies around and throw them back to knock out their friends, snare them while delivering a kick in midair, use electric webs to shock the baddies, use drones to assist in a fight and even a sonic boom to clear out swarming enemies. If stealth is your strategy, you can lay trip mines and lure an unsuspecting enemy or plaster enemies against the wall on the sly. 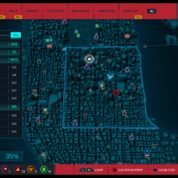 Depending on your fighting strategy, you can choose to level up Spider-Man through three skill trees – Innovator, Defender or Web Slinger to unlock certain moves and also to earn Focus. By filling up the Focus bar, Spider-Man can heal up or execute a spectacular finisher move on an enemy. With so many possibilities, combat is really fun! However, this doesn’t mean that Spider-Man always comes out tops – bad guys come in different shapes and sizes and are armed with different weapons, which means Spider-Man needs to adapt the tactics used to defeat them. For instance, big brutes are immune to normal and air attacks, but take damage when objects are thrown at them. Yes, the game lives up to the hype. Although there is limited replayability since the game is purely an offline experience, and one may not play through the game multiple times, you will have lots to do if you are a perfectionist or completist trying to complete all the side quests and research tasks, and stop every crime. Plus, the downloadable content pack, “The City That Never Sleeps”, will be released at the end of October, keeping gamers glued to their controllers. Marvel’s Spider-Man retails at S$69.90 for the disc version and S$64.90 for the downloadable digital version on the PlayStation 4 console. If you are a true blue Spider-Man fan, you can get a PlayStation 4 Pro console in red featuring the iconic Spider-Man logo, a matching Dualshock wireless controller as well as the Blu-ray Disc version of the game at S$669. Definitely be a conversation piece with its bold colours. Marvel’s Spider-Man lives up to the hype and does not disappoint. It combines the best ideas of open world games and has a slew of interesting collectibles, side missions and tasks that will keep you occupied for a long time. Its fabulously innovative and fun combat system and engaging plot with strong and memorable characters makes this game hard to put down.